Do you or a loved one in your life suffer from memory loss? Have you ever wondered if it's dementia, or is it just normal aging? 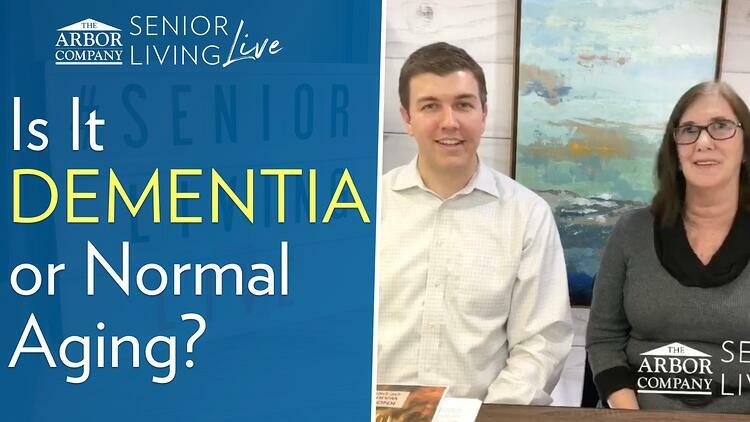 Watch our episode of Senior Living LIVE as we discuss the difference between what should be considered "normal aging" and what would be the warning signs of actual dementia. Chris: Do you or a loved one in your life suffer from memory loss? Have you ever wondered if it's dementia, or is it just normal aging? Well, that's the topic that we're focused on today, and I think we're going to have some really good answers for you. Hey, everybody. I'm Chris, and this is Senior Living Live. This is a show that's designed to dig deep into the world of senior living and give the answers that you need so that you can make informed decisions and live the life that you or your loved one wants to live. That's our mission. Today, we're talking about dementia. And we're going to touch on Alzheimer's disease, as well. That's the one that a lot of people know of. But specifically, we're going to talk about the difference between what should be considered "normal aging" and what would be the warning signs of actual dementia. Now, I will tell you, I am not an expert in this field in any way, and that is why I invited someone very special to join me on this show, today. If you're watching live, please leave a comment and say hello and help me welcome Susan Robbins, right over here. How are you doing today, Susan? Susan: I'm doing good, Chris. Susan: I'm glad and excited to be here. Chris: Well, we're excited to have you. And I think that, you know, I've been wanting to get you on this show for a long time because I know that you're just so knowledgeable. And I will tell you—and you will all see very soon—that Susan is so articulate when it comes to talking about these things, and she can just break it down in ways that so many people just understand. So, thank you so much for that. Chris: Susan is one of our resident experts on dementia, and she spends the bulk of her time training our staff members on how to interact and care for residents who have various forms of dementia. And that's a key component here. And, you know, we're skipping ahead a little bit, but there are several different kinds of dementia, right, Susan? Susan: Yes, there are. There are over 70 different types of dementia, and Alzheimer's is the most common. A lot of people find and think that there's a difference between dementia and Alzheimer's, but, actually, Alzheimer's is a type of dementia. Chris: It's a type of dementia. I think of it as—that it's like geometry where a square is a rectangle, but a rectangle is not a square. Chris: I'm a geek, I guess. But, yeah, so, more than 70 different types of dementia. And so, Alzheimer's is a common one. What are some other common ones that we hear of? Susan: Well, Alzheimer's is the most common that we hear about. But then there's also Lewy Bodies dementia which affects the proteins in the brain. And although it still creates problems and memory issues and the things that we normally associate with dementia, it also slows down your judgment first. And with Lewy Bodies, lots of times, people will have delusions or hallucinations—and that's really hard for a family member to understand—and they become very real, and lots of times that causes paranoia and unpleasant things. That's why they think people steal things from them and take things. It's part of that hallucination. Or they'll tell you that somebody's in their bathroom. And in actuality, it's their own reflection coming back. Because dementia takes your ability away, sometimes you think you're younger than you are, and so that reflection coming back can actually be your own reflection, but you don't recognize it with the dementia. Or you see people that you want to see, that you haven't seen. You know, like, "My Uncle Billy came to visit," but Uncle Billy's been gone for a long time. Chris: Wow. So those are just so many different examples of the way that our minds change with the condition of dementia. And every one of these 70 or so diseases is different, right? Chris: So you have to be able to know how to recognize that, and of course, with medical assistance with doctors and things. Susan: Right. Doctors following up and helping you decide what the process is and understanding how to treat from a medical position. But the biggest thing is, overall, understanding that what they need is patience and understanding from us, and we have to learn to live in their world, even in the early stages, because it's very fearful when you forget things and people tell you [that] you didn't or they've already told you that. And it creates a lot of anxiety, and that's where people become unpleasant and [don’t] want to be around people because they've become angry. Chris: And there's the conflict in all of that. Wow, wow. Well, we're probably getting ahead of ourselves a little bit, getting into some of this. Our topic today is really just looking at what are some of the warning signs of dementia and then how that compares to normal aging, because our minds change as we get older. Susan: They do change. By the time you're 75, you slow down a little bit. Not everybody gets dementia. And at 75, you just move a little slower. Things that used—like, you used to be able to go in the kitchen and cook dinner, throw something together, and it [would] take you 10 or 15 minutes. Now it might take you 10 or 15 minutes just to get the stuff out and get it ready to be prepared to cook it. Susan: And that's normal. That's normal. Chris: Yeah. That's not something to be alarmed about. A lot of times people—I think a lot of people joke about this, but they have senior moments, right? Chris: That's totally normal. But what we're talking about today are the things that should be a little bit more of a red flag, perhaps, that you should seek advice from a professional, like a doctor. And we'll get into that a little bit. If you're watching us live, as I said before, please let us know in the comments right below the video. We would love to hear a hello from you and also any questions or comments that you have about dementia or what we're talking about today. Susan really knows her stuff over here, and you've got the expert right here in the house, so be sure to leave those comments now and we will get to those during the show. Let's see who we do have [that] joined. I think we've had some other folks. Susan: That's right, you did. And I'm sure there's some things from your mom. Chris: I'm sure there is, too. I don't go back through it very often. I figured I'll have time for that in the future. Chris: Beth Richardson has joined. Hi, Beth. And she said that her three things would be her favorite family picture growing up sailing on the Great Lakes—that sounds fun—and her favorite picture of her wedding, and her boys, which is a box of the special items that were passed down to her three boys. So, exciting. There are so many great ideas. Susan: And I can go back to Beth sharing that she was—her picture was sailing. That is something, too, that when somebody starts to lose their memories and lose things, having those special things helps create a conversation, because those three things that you pick out when you really think through it are what you're emotionally attached to. And although you do forget things, you still have feelings with dementia. So that's great. That would be something you would have a conversation, maybe not the details, but could talk about sailing and being on the Great Lakes and where you are from. There's a lot of information you can gather from those precious things. Chris: Yeah. So I guess, basically, there's a difference between remembering what you had for lunch on some random Tuesday and an actual experience or a feeling that you had during this long period of your life, which it sounds like Beth's talking about here. She probably went to the Great Lakes more than once, and this was one picture that represents a period of her life. Susan: Of her period of life. Susan: That was very important. Chris: A lot of what we're going to be talking about today is available in a free guide that we have created for you. The guide—I've got a copy of it right here. It is called, The Early Warning Signs of Dementia, and you can get a copy of this. If you'd like that, you can just head over to arborcompany.com/dementiaguide. Or we’ve got it easy for you: Just type the word "Guide" in the comments below and we'll send you a link right through Facebook Messenger. Sort of like a text message. So be sure to do that and we will get that to you. And we also have a link below in the comments that you can take a look at. Okay, Susan, let's get into it. I have a question, and I think that that's really what everybody here is watching. It's what they're looking for. So what is the difference between what you would consider normal aging and actual full-blown dementia? Susan: Dementia. Well, we talked about being able to go in the kitchen and it taking a little longer to fix a meal, but you still know all the things that you need to fix it. If you've got dementia, you may go in and make a peanut butter sandwich, and it'll only be two pieces of bread. Susan: Or you can get the jar open, or it's a jelly sandwich with no peanut butter. And it's just the processing stops. That's one of those early signs. And then eventually, you're not able to find any of the items in the kitchen to make … put together. Susan: You can't remember the steps. Chris: You can't remember the steps, okay. Susan: You can't remember the steps to do it. You can go in—and then that's what creates agitation and sometimes people will—you know, my mom has always been this really sweet person, and all of a sudden, she just gets in the kitchen and starts throwing things because she got upset because she can't recall what she'd been in the kitchen to do. We talk about things like losing your keys, and it's okay to lose your keys and that's normal, but when the keys are lost to the point where they have to be replaced over and over again, then you've got an issue, and that's kind of the difference. And with normal aging, you ran in the house and your phone rang so you set your keys down in some place that you don't normally set them down. So it took you a while to go back and backtrack where your keys are. But again, with dementia, it has nothing to do with it. They've just been put in some strange place. You've hidden them from yourself because you're afraid somebody's going to steal them—those type of things. Chris: Okay. So I know we've kind of gone through a couple of these. I want to pause for a second and see if any of you watching at home, is this stuff making sense to you? I think that we hear it a lot and I know that, Susan, this is from material that you train our staff members [with], right? Chris: So we kind of operate under the assumption that—we believe that all of our staff members in our senior living communities need to know this information, so they go through at least a minimal level of dementia training that is led by people like Susan. Chris: And so, this is some content that we've pulled from that. But if you have questions at any point in time as we are talking about this, just leave those in the comments and I'm going to be monitoring those. If you see me look down from time to time, that's what I'm doing. And I'll be sure to post those to Susan while we've got her here. Okay. So what else would you say is normal aging versus the dementia side of it? Susan: One of the things that always scares people is forgetting people's names, because socially, it's not acceptable to not remember somebody's name. But with normal aging, you've got so many people that you've met through all the years. There's a whole file cabinet of names, and you don't always recall somebody's name. It doesn't mean you don't remember where you met them, what the details are about them, who they are and what they do, what significant role they play in your life, but you just can't come up with their name. But if it starts to be more dementia, I see a neighbor that I've talked to every day and I don't remember she's my neighbor. It's not so much about her name; I don't recognize who she is in relationship to me. Chris: So it's not recognizing someone who you probably should know. Chris: Because you had a conversation with them yesterday or something? Susan: Exactly. And that's the same thing that, unfortunately, happens. The difference between you might call your grandkid your children's name. That happens just because—I mean, sometimes I've called my kids the dog's name, you know? It's just people that you associate with all the time. But when you can't come up with names at all or you start to not recognize the relationship with people—or one of the things that's really difficult when dealing with somebody with dementia is when they don't remember who you are. Your mother doesn't remember who you are. But if you take away one thing today, it’s to remember that they may not remember what relationship they [have] to you, but they still know how you make them feel. People with dementia do lose their memories and sequencing of things, but they don't lose their emotional feelings and their attachment to people. Chris: Okay. I'm going to ask you a question. This is probably getting way far ahead of our topic today, but that kind of makes me think. So, number one, what you're saying is, they feel the emotion of the interaction regardless of if they know who you are, so that, to me, says it's important then to not get frustrated, right? Chris: And because they're going to feel that frustration and nobody wants to make someone frustrated, and then it's just sort of back-and-forth frustration. But also, what should you do if someone doesn't know you? Like, if I walked up to someone who, you know, a grandmother or something, and she's known me my entire life and now she doesn't, should I introduce myself? I mean, is that—should I treat it like a first-time situation or what? Susan: That's a beautiful question. Just, "Hi, it's Chris." Chris: I'll give you a shake there. Susan: Yeah. "Hi, it's Chris," and reach out for a hug. And if they don't respond back, then you know, and give them a minute. And also give them time to respond to you so that they know you're interacting with them. Get their attention and just start a conversation. Don't go in and ask questions. One of the biggest stumbling blocks for somebody with dementia that causes frustration and anxiety for them is when people ask them questions. And when I can't answer your questions, I feel really frustrated and then it comes out as anger because I don't want you to know I don't know the answer. Chris: And that could be, I'm guessing, a simple question like, "What did you have for lunch?" Or, "Did you enjoy your lunch?" Chris: So what's an example of something that you could ask? You know, that's another topic that we can probably discuss on a future show: How do you interact with someone with dementia? But, you know, what are some of the things you could say? Susan: So, "Hi, Chris, it's really good to see you. I'm headed out for a walk. You want to come with me?" And then we just walk outside and we look at what's outside. We may pick up your memory box. "Wow, this is a beautiful box. Are there treasures? Let's look at the treasures that are in there." Not, "What are the treasurers in there?" "Let's look at the treasures in there." Chris: So it's sort of some rhetorical questions? Chris: Okay. Okay. Well, that makes sense. Yeah, that's really good. Let me look back at the comments here. Laura Ellen mentioned, "What about forgetting people's names? Is that normal?" We discussed that a little bit. That might have come in right before we said that. But forgetting people's names that is—I do it all the time, so I think that's pretty normal, right? Chris: Okay. What else do we have on the list here? I see you've got some notes about some other things. Susan: Well, pausing to find words, that is also very normal as you age. But it doesn't mean you don't know what the word is. So you're just like, "Okay, I'm going to go to the grocery store and I need apples and bananas. And, oh, shoot, I'm standing in the produce section. What was that third thing I needed?" And you look around, "Oh, it's the oranges. So I need apples, bananas, and oranges." So I'm happy. But, with dementia, you may go into the grocery store and not remember you needed fruit at all [or] what you needed. I just know I'm in the store. And lots of times we'll have residents who'll end up at the candy counter, because what makes you feel good? Candy. I don't need bananas and fruit and stuff. And that's a good sign, their choices that they're making. Or maybe they love green beans, so they'll come home with 10 cans of green beans or 20 cans of green beans. And every time they go to the store, they come back home with 10 or 20 of the same thing. Those are some of those warning signs. That's the difference. So if you go to the grocery store and forget the oranges altogether, you're okay. You're in good shape. But if you repeatedly come home with 10 cans of green beans, then maybe we need to take a ... deeper look into what's going on. Chris: Okay. So, Beth here says, "How long should you wait to let someone answer if you ask a question?" Susan: It could be up to 20 seconds that you actually—and if you stop and think, that's a long time, but as the brain runs slower, if you ask again, they've got to start all over processing what you said. Chris: And so while that time, that 20 seconds or so, may feel awkward for us, it's not awkward for them because they're actively processing it in the moment. Susan: Right. And they need that time. It's almost as if you have to have a halted speech conversation. Chris: Okay. Or like the international phone calls in the 1940s or something, where they had a 30-second delay. Susan: Exactly. Yeah, 30-second delay. Yeah. It's like talking on a delay. Chris: Okay. Well, that's a great question, Beth. Thank you for that. What else do we have? Susan: Well, problems finding words and understanding words. And we know that people, as they process through dementia, begin to lose their vocabulary. But what happens is, sometimes, just when they lose their vocabulary to talk to us, they don't understand our vocabulary. And many times it's hard to—when you don't get a response from something or they tell you they don't understand you, you start to give them more words and a bigger explanation. And the worst thing that somebody needs who has a loss of vocabulary is more words. At the point where somebody starts to not understand you, you need to add some visual cues to communicate with them. Chris: Describe what a visual cue might be. Susan: Well, at first, it may be, "Hey, let's go get something to eat," and just your hand up here. And then later on, we may need to actually have a drink in our hand or a fork in our hand for them to understand what it is we want them to do. And even later stages, you actually take a drink together. Chris: Yeah, okay. Yeah, and I know I've heard that dehydration is a very real concern for seniors, particularly people with dementia, right? Chris: Senior dehydration is a big deal. And so, maybe the right step is to not say, "Do you want something to drink?" but to offer the drink right there so they don't have to deal with answering the question. Susan: That's it. You got it. Chris: I'm learning. I'm learning. Chris: Laura Ellen asked another question. She says, "What are the first signs of dementia? Is it forgetfulness?" Susan: Well, we have a tendency to think forgetfulness is one of the first signs of dementia. But it actually starts with the frontal temporal lobe, which is your judgment and reasoning. So you will find a change in personality where people make poor choices. Like, let's say somebody has always been very frugal with their money, and all of a sudden, every TV ad that wants a donation, they're making those donations. And, because it's their personality [that] has changed, they're just, "This feels good. I'm going to do it." And different things. They don't make good decisions. They may decide they don't want to take their medications anymore because they just don't feel like it. I can't make good choices and good decisions. Chris: Now, if someone has—I don't know how to say this properly, but maybe someone has always made questionable decisions. You know, if they continue to make not good or questionable decisions, that's not really a change. What you're really looking for is the change from what you would have considered normal in that person, right? Susan: Exactly. And actually, that's a really good observation, Chris, because sometimes what happens is, we think of a change in behavior as being something negative and something somebody doesn't want to do and they get mad or forceful. But, if I've always been kind of unpleasant and not made real good decisions, I may all of a sudden become very pleasant, which could be really dangerous because I may go to the grocery store, because I'm in the early stages, and I may decide to bring somebody home with me. Well, that's probably not a really good decision. Chris: At the risk of being taken advantage of or things like that. Chris: Okay. That makes total sense. What about someone who just needs reminders? I know we have a lot of residents in assisted living who need a reminder to, I don't know, take their medication or something like that. Is that normal? Susan: It is normal. We all need reminders no matter where we are in life, because we're all so busy. But, as you age, you do need reminders. And at the beginning, it can be things written down or different things, and it's okay to forget. You know, "I know I've got a doctor's appointment on Tuesday but I can't remember what time the appointment is," and have to look it up. That's normal aging. But, "I know I have a doctor's appointment. I have to go right now," is not. Or not remembering that anybody made the appointment. "Make the appointment." "But I've told you when your appointment is 10 times," but I keep coming back and asking. Or they call their family member and say, "I need to go to the doctor." "Yes, Mom, it's on a note on the refrigerator," but I no longer know to go look on the refrigerator for the reminder to help me. And that's kind of that transition. Chris: Okay. So not knowing where to go for help? Chris: Okay, that's a really good point. Mary has joined. We're so happy that you have joined us, Mary. She says, "This is so insightful. Thank you," with a smiley face, "for talking about this." So thank you, Mary, for joining. We are very happy to have you here. And thank you, Susan, for sharing this stuff with us. Anything else, do you think, on that list of normal versus dementia that we haven't covered? Susan: I think one of the things that ... it's very hard when you're living with somebody that has dementia, is they ask those repeated questions. And once you understand that actually it's not that they're asking a question over and over again, they don't remember they asked the question—because many times, probably the fifteenth time you've asked what time dinner is going to be, by the fifteenth time, you go, "6:00," and they go, "Why are you mad at me?" because they don't remember they've asked 15 times before. So, being patient with those responses is really important, and understand, "I don't remember that I asked." Chris: Okay. So we've talked about a lot of these things here that we can consider them as warning signs, early warning signs. And one of the questions that, as we were preparing for this show, I wanted to ask you was: What kind of doctor should someone see if they feel like that themselves or their loved one may have dementia? Do you just go to the same doctor you've always gone to, or do you go to a psychologist? What do you do? Susan: Well, you can go to your regular doctor and he may refer you to either a doctor that is a gerontologist who actually understands the aging process, or a neurologist, but a neurologist that asks those questions. Do they understand dementia and do they handle residents or people with dementia, patients with dementia? Because the medical field, although it has come a long way, you've got to get in to the right doctor to make sure you're getting the care that you need. That is so important to make those next steps and help you make decisions. Chris: And that may not be the same family physician that you have gone to for the last 30 or 40 years. And I think that we've seen that in some of our communities, too, is that you need to create a care team of physicians and people to give you advice and all those types of things. Susan: And also help you make the transition if you're no longer able to care for them at home, because that time period does come where you need more assistance and that physician can help you make those decisions—because when you're the caregiver, it's hard and you need a break sometimes, too. Chris: Yes, absolutely. The caregiver, it’s super important to support the caregivers. And I know that a lot of people watching today are likely caregivers. And so, one final question I have for you, Susan: Are there any cures for dementia? Susan: We have not come up with cures. There are medications that can slow the process somewhat, but they have not come up with a cure. Chris: And I know there's some activities and some—keeping the mind engaged, I know, is an important piece of it, right? Susan: Well, staying social is really important. But finding those people that you can be comfortable with to be social, because as you progress through dementia and in the early stages, you're trying to hide it because you're conscious of being—and they just notice more the forgetful part of that in the beginning, and they don't want anybody to know they're forgetful. But if they're around other people that are forgetful, then, they can thrive and feel better because they're in the right area. And that's why there are so many different stages of dementia that Arbor helps our staff and the public know that you go through, so that you can understand the best placement and help them be with their peers so they can thrive. Chris: Yes. And I think that is super important, too, being around people who are in similar situations, that we see that as a huge piece of that. And I think that is something that if you will join us again, we will talk about in a future episode, which is the different stages of dementia. And there are different scales out there, right? Chris: But some of the ones that we use are helpful in explaining that. Susan: Yeah. I'd love to come back and do this again. Chris: Good. Well, good. Thank you. Thank you. So, we covered a lot of stuff today. And honestly, we've really only scratched the surface. Dementia and the related illnesses to dementia are complex, and the science has really only gone so far with truly understanding them and learning how to treat them. And that's one of the things that makes this frightening and scary, right? Another one is this whole idea of someone's personality changing. And as a society, I think that we don't do a good enough job of supporting people with dementia, people with dementia and their caregivers, as well. These are diseases that affect a lot of people, and that's why we've got to talk about them. And that's conversations like we're having right now. It's okay to be afraid of the disease, and I'd say it's even okay to be afraid of what may lie ahead, knowing that there's no cure. But it's not okay, I think, to be afraid to talk about it. And that's what we're trying to help you with here with conversations like this. Don't wait to have those conversations until you've had a diagnosis. Don't wait until you're at your wit’s end as a caregiver. If any of these warning signs that we talked about today struck a chord with you, if there is something you are seeing in your loved one, talk to somebody. That is super important. And our communities—and really in any senior living community out there or dementia care community—you're going to find people who understand what you're going through. They've seen this, the stories don't surprise them, and they will let you know that there is no shame, no shame at all in dementia. Unfortunately, it's something that happens a lot. And so, I encourage you to have a conversation. Reach out to somebody and just see where it goes from there. Now, in the introduction of our show today, we talked about the Know the Early Warning Signs of Dementia guide that I've got right here. Laura Ellen, our Vice President of Engagement and Training, she wrote a letter at the beginning of that, and she ends the letter with a line that I think is so true. She says, "The path is different for every family, but this one thing is always true: You're not alone." And that's our message to you today. If you'd like to download a copy of this free guide, Know the Early Warning Signs of Dementia, just head over to arborcompany.com/dementiaguide. That's arborcompany.com/dementiaguide, or just type the word "Guide," that's G-U-I-D-E, in the comments right below this video, and we'll send you a link through Facebook Messenger. And if you saw anything today that you think someone else may find helpful, please share this video with them or mention their name in the comments so that they see it. We want to get this information out so that we can help as many people as possible. I hope you'll join us next week for another edition of Senior Living Live. We go live at 6 p.m. Eastern every Wednesday. Susan, thank you so much for sharing your knowledge with us today. Please don't be a stranger to this show. We've got a lot more things to talk about related to dementia and cognitive care. I'm very excited about that. Susan: Great. I'd love to come back, dig a little deeper. Chris: Definitely. There are so many different directions we can—my head is spinning from all the different directions that we can take that. So, look for that in an upcoming show. Again, that's Wednesdays at 6 p.m. Eastern. But for now, we will see you next time. Bye-bye.